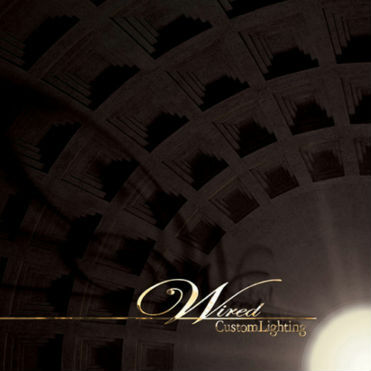 For their 2008 catalog, Wired needed a book to elevate their products into the luxury market. 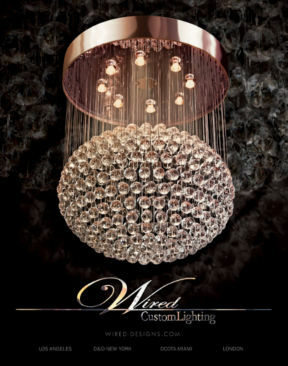 The dark tones contrasted with the glimmering fixtures and correlated with the message of the international ad campaign: sensual and mysterious. Browse the thumbnails below for more info on this project. 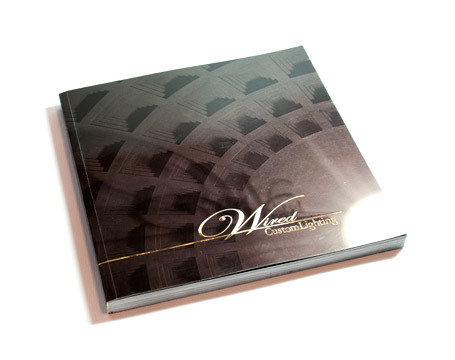 The dome of the Pantheon in Rome was chosen for the cover image as a metaphor for both the meticulous craftsmanship and the timeless nature of the products inside. The gleaming oculus provides a less than subtle reference to the nature of the industry while providing a focal point for the logo. 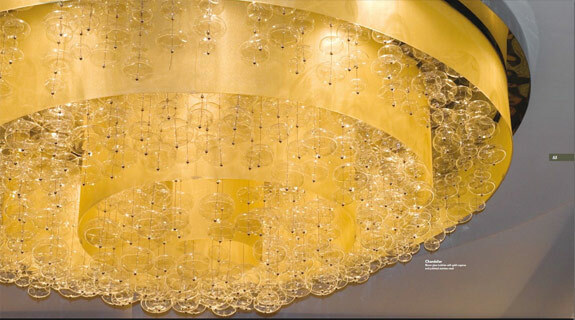 To place maximum emphasis on the product, fixtures were stripped of their surroundings, while close-up photography highlighted the meticulous details. 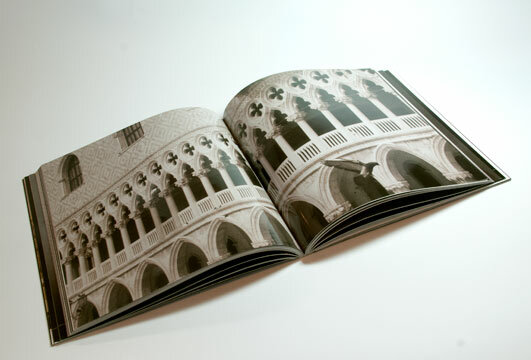 To cleanse the visual pallet between sections, a variety of Italian architectural images were added. 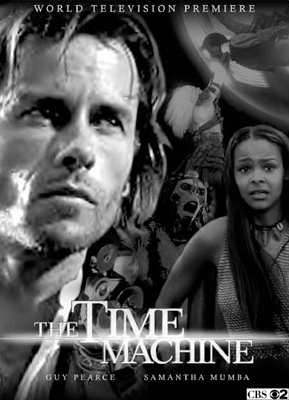 These would also extend the narrative suggested by the cover image. To place maximum emphasis on the product, fixtures were stripped of their surroundings, while close-up photography highlighted the meticulous details. 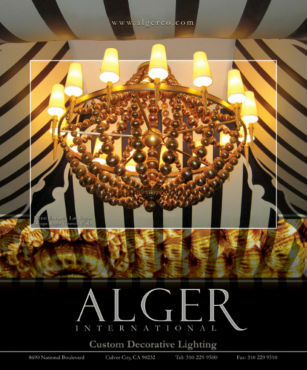 Again mirorring the ad campaign, the soft, smoky backgrounds exhibit a mysterious sensuality and heighten the allure of the luxury market. This project also marked my first exposure to product photography as I explored how to display the best qualities of each fixture. 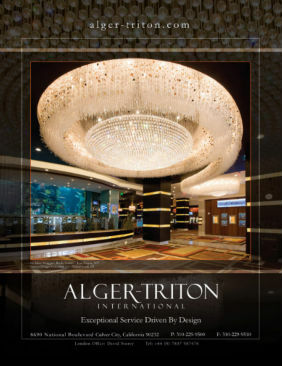 For their 2011 catalog, custom lighting powerhouse Alger-Triton needed a book that reflected their strong position in the industry for nearly 30 years. 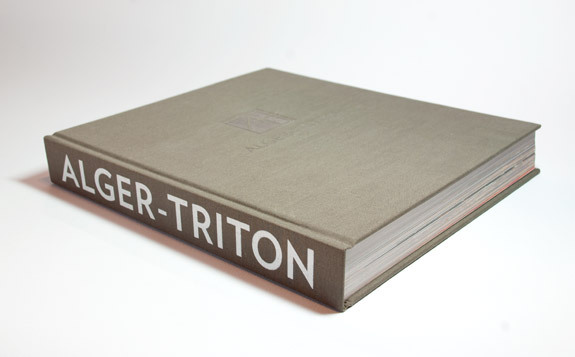 At nearly 400 pages, this massive compendium of installation photography was the largest project I had been involved with to date. The subtle exterior and large volume exudes a feeling of power and mystery. 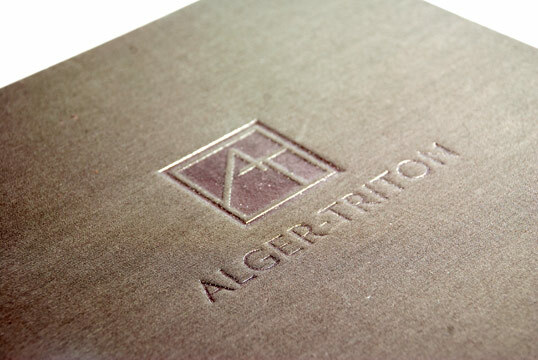 In contrast, the large logo type on the spine can be noticed from across the room. 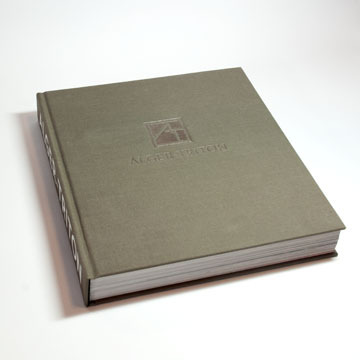 The book uses materials found in the manufacturing process of many of the fixtures inside: the soft silk texture billows around the hard pressed silver leaf logo. A far cry from the subtle exterior, the interior boasts vibrant, full-bleed photos displaying the full range of colors and materials used in installations around the globe. 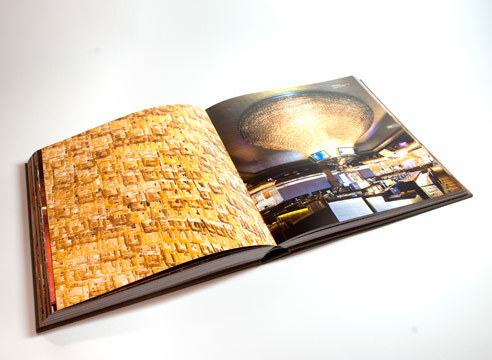 Very light on copy, this book uses the stunning visuals to tell the whole story. 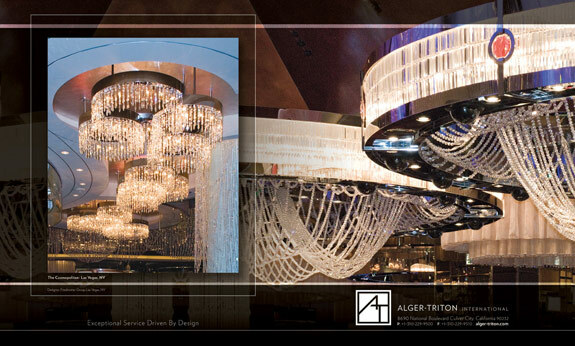 Traveling to several dozen locations to photograph the completed installations was the highlight of this project!! Deferring most of the graphic design work to our team in Los Angeles, I was able to concentrate on capturing the beauty of the installations on film. 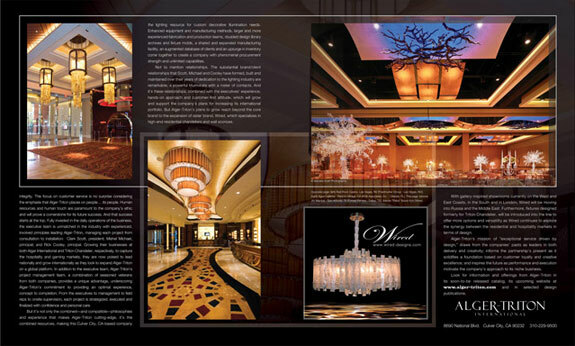 Sidenote: I was honored when this photo was chosen for the cover of Gulf Interiors magazine. 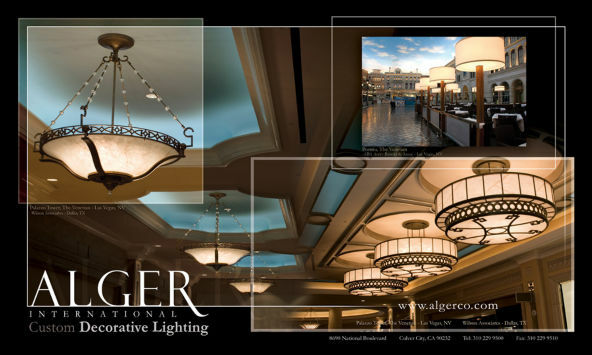 Much like the international ad campaign, the contours of the fixtures are used to frame the composition and direct the viewer's eye from page to page. 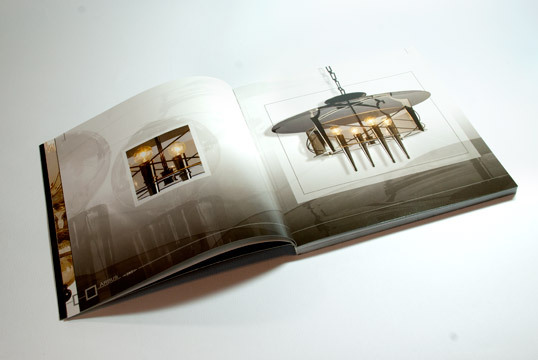 Originally created as a 4 page magazine editorial, this layout was re-run as a corporate brochure. Building on the previous season's campaign metaphor "Bathed in Light", this layout impresses the idea of timeless illumination. 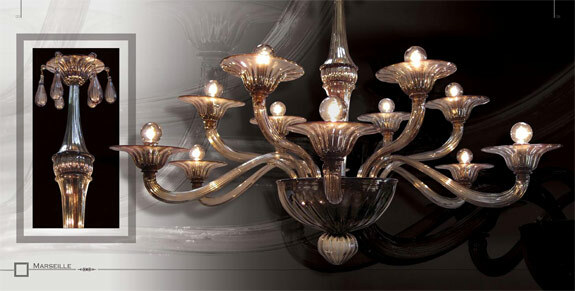 The fixture is elevated from a functional tool to a piece of art. 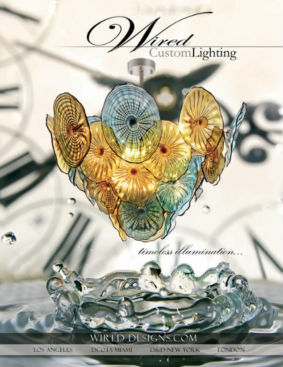 A favorite of mine from the "Bathed in Light" campaign, this ad highlights the detailed reflections from each glass drop and exposes the sensual nature of the sculptural design. 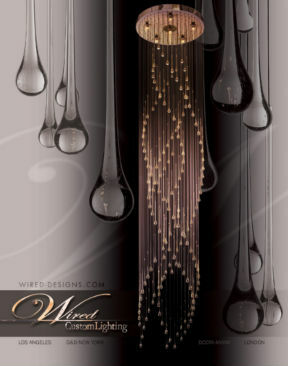 Highlighting the infinite ring of oscillating glass tubes, this ad primarily speaks to the quality craftsmanship of the product, while the swirls and smokey atmosphere subtly add an air of mystery to the brand. 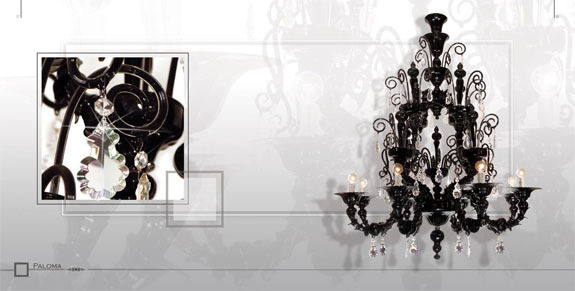 A selection from the "Jewelry for the Home" campaign, which further elevated the luxurious quality of these custom lighting designs as far from your average home fixture. 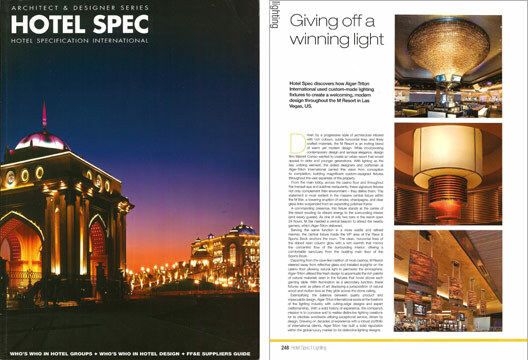 To achieve the highest impact in industry publications, it's hard to beat a double-page spread. 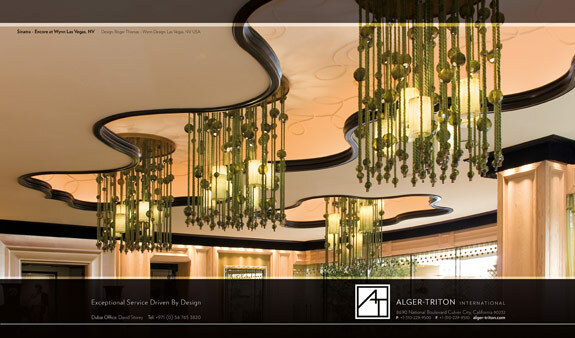 For this ad, the undulating curves of the fixtures lead the viewer's eye directly towards the company info. Browse the thumbnails for more examples before moving to the next project. The movement of these fixtures frames the layout and opens enough white space for an impactful logo. This ad was included here because it demonstrates how the gutter of a publication can be used to aid the design. As a poster, this layout would be weak in the center, but in the magazine the perspective projects beautifully towards the edge of each page. 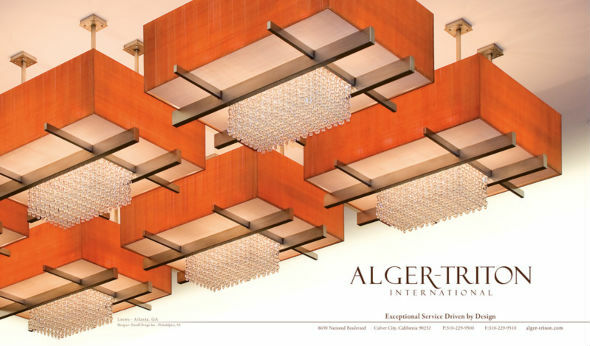 Though not as spacious as a double-page spread, a single-page ad can still convey plenty of movement given the correct visual angle of the photo. 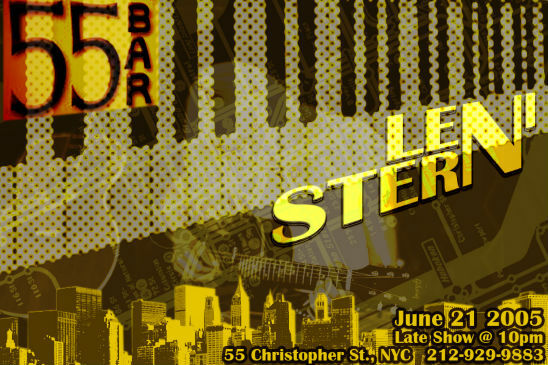 A few graphic additions helped pull this fixture right off the page. A popular choice, this ad was re-run in several industry publications. 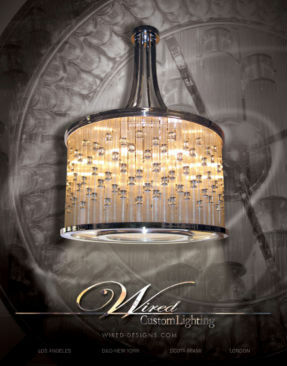 My thanks to the Wynn Encore for allowing me the time to shoot this fixture from a seemingly infinite number of angles. 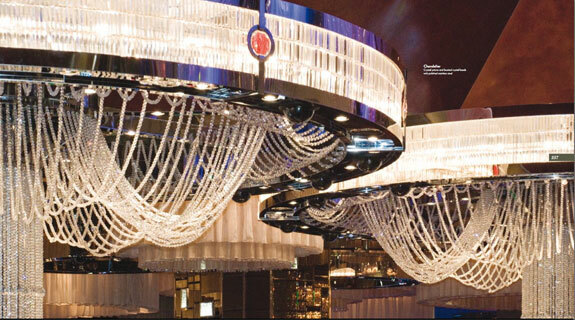 The symmetry of the surrounding tent was a perfect element for drawing the viewer's eye towards the fixture. 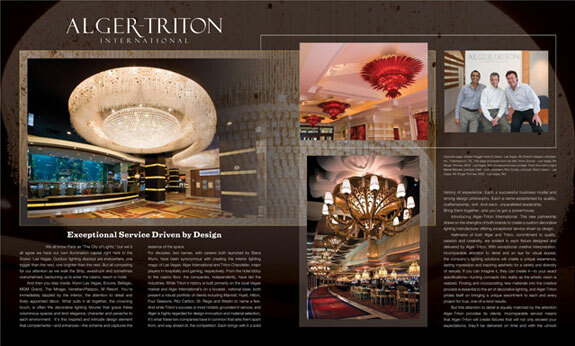 For the annual Hotel Spec publication I was asked to submit images from one of Alger-Triton's most stunning installations (the M Resort in Las Vegas) along with an editorial write-up about the design inspiration. I was very glad to finally see this in print as it represents my photography along with my editorial writing.